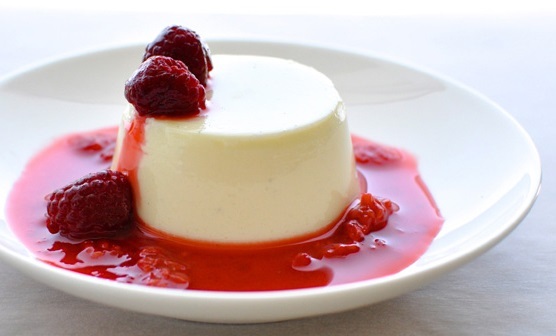 Panna Cotta: Panna cotta is an Italian dessert traditionally made by blending thick cream,egg white and honey. The blend is then baked in a bain-marie in a low oven. Simpler version of the recipe is made by simmering together cream, milk, and sugar and flavored with vanilla, mixing this with gelatin, and letting it cool until set. You can eat the panna cotta straight out of a cup, but it’s often unmolded onto a plate and served chilled, drizzled with sweet sauce and garnished with fruit. Heat the gelatin mixture over low heat until gelatin is dissolved completely. In a large saucepan bring cream, half and half, and sugar just to a boil over moderately high heat, while stirring continuously. Remove the pan from heat and stir in gelatin mixture and vanilla extract. Divide the cream mixture equally among the eight ramekins and cool to room temperature. Chill the ramekins, covered, at least 4 hours or overnight. Fill a large bowl partway with warm to hot water. Wipe a dessert plate with a damp paper towel (a damp plate lets you reposition the panna cotta more easily if it doesn’t fall in the right spot). Dip the ramekins, 1 at a time, into a bowl of hot water 3 seconds. Run a thin knife around edge of each ramekin and invert ramekin onto center of a prepared dessert plate. Panna cotta is ready to be served. Serve the chilled panna cotta garnished with raspberry compote. If you have any queries regarding the Panna Cotta recipe, please leave a comment.